Youngsin Metal Ind. is Korea’s leading fastener maker. 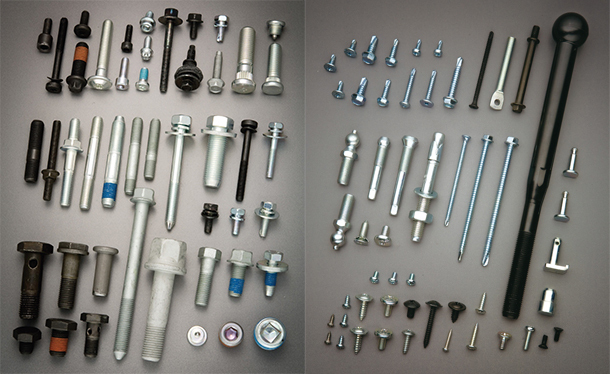 From its inception in 1967, Youngsin has emerged to manufacture more than 10,000 different kinds of fasteners in Korea. As the first developer of stainless-steel screws and self-drilling screws, and building rivets in Korea, Youngsin has steadily developed new quality items and thus received a great deal of attention from worldwide customers. With the rapid growth of the automobile industry in Korea, Youngsin has established a second factory specializing in precision and high-grade fasteners and forging parts, and is doing its utmost to develop new items. Youngsin has a clear focus and a commitment to produce world-class products with the acquisition of international quality standard ISO/TS 16949. The maker is endeavoring to be a reliable supplier for GM, Hyundai Motors, GMDAT, Kia Motors, Samsung Electronics and LG Electronics, etc. The current Youngsin’s flagship product line-up includes bolts and screws for automotives, electronic goods, and SDSs(Self Tapping Screws) for construction. Filed Under: KOTRA Tagged With: forging parts, High-grade fastener, self-drilling screw, stainless-steel screw, Youngsin Metal Ind. Co. Ltd.